Travel by private taxi, van, minibus or bus from Brno to Vienna. Brno is the second largest city in Czechia by population and area, the largest Moravian city, and the historical capital city of the Margraviate of Moravia. It’s known for its modernist buildings, like the restored Villa Tugendhat, completed in 1930 by architect Mies van der Rohe. The medieval Spilberk Castle houses a city museum, gardens and a former prison with vaulted tunnels. The Cathedral of St. Peter and Paul has baroque altars, a 14th-century statue of the Madonna and Child, and city views from its steeple. 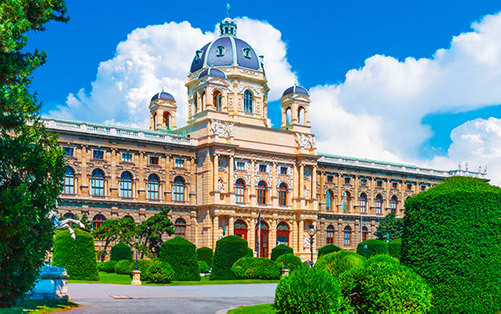 Vienna (Wien, Viena) is the capital of the Republic of Austria and by far its most populous city, with an urban population of 1.7 million and a metropolitan population of 2.4 million. Vienna developed from early Celtic and Roman settlements into a Medieval and Baroque city, the capital of the Austro-Hungarian Empire. The historic centre of Vienna is rich in architectural ensembles, including Baroque castles and gardens. Vienna, also described as Europe's cultural capital, is a metropolis with unique charm, vibrancy and flair. It boasts outstanding infrastructure, is clean and safe, and has all the inspiration that you could wish for in order to discover this wonderful part of Europe.